Today is the last and final day of The How-To Gal's week-long giveaway! Thank you for helping me celebrate FOUR years blogging. Be sure to enter all of the giveaways before the end of today. Winners will be announced Monday, March 25th. To end the week with a BANG, Cricut has generously offered a Cuttlebug to a How-To Gal reader! The winner will also receive two folders (the embossing templates) to go with it!! 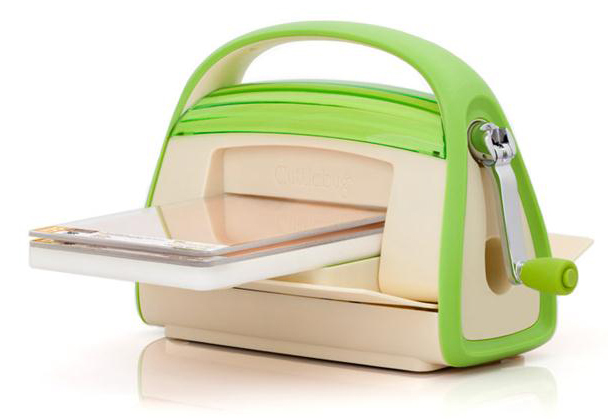 I love, love, love my Cricut Mini and am so jealous of whomever wins the Cuttlebug! I've never used a cricut. I would love to try it out! Congratulations on 4 years of letting us know how ya do it! I love the post on Es room! thanks! And congrats on 4 years! I haven't used a cricut either but I have seen all the cool things you can do with them. I am actually going to a onesie party tonight for a baby shower and I also just looked at all your fun ideas for onesie's that you did for Hailey's shower. I am excited to get my craft on tonight. All of my friends have a cricut but I don't! I would love to win this. I think my favorite right now is the dining room table... but my favorite changes daily. But right now I'm looking at changing our table so that is why its on my favorite list. how fun! I could use this for so many projects. Fun giveaway week! The quiet book tutorial is prob my favorite- I always think that someday I'll try and attempt to make one, hah. That herringbone dresser you did a while ago is soooo gorgeous! I wish I could find a great piece like that so I could make one too! Or I'd settle for this swanky embosser too. I love the tutorial for the Maxi skirts!! Wow, you saved the best for last! It would be exciting to win that Cuttlebug! Another great post was the lace on the black tee shirt! Such a great idea! The chevron blanket is my favorite.thanks for all your sharing. It is hard to pick a fave.